Get Ready for Grilling Season! Watch a video highlighting all the key features. View this short clip for assembly instructions. Read the manual for additional specifications. Check out John McLemore's Dadgum That's Good! Cookbook. You don't need a big yard for your barbecues and parties--but you do need a grill with a big cooking area! 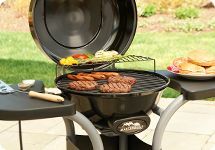 Perfect for patios, courtyards, or balconies, this Masterbuilt electric grill boasts a full 322-square inches of grilling surface--plus all the features you need, at a really hot price. Power and performance. With 1650 watts, variable temperature control, and a secondary area for warming buns and side dishes--this compact, mobile unit offers all the benefits of a traditional grill without the hassle, mess, or concerns of open-flame cooking. There's no charcoal or propane to worry about, and the porcelain-coated grates infuses your meals with the classic barbecue look and taste that everyone loves. From burgers and dogs to steaks and kabobs, preparing all your summertime favorites is a breeze! Clean-up is super-easy--and the included cover lets you store the unit outside until you're ready to grill again. Small unit, big flavor. This streamlined electric grill is a great alternative for apartment, townhouse, and condo residents, who can't use gas or propane grills--or could just use a little extra space. Plus, bottom and side shelves with utensil hangers offer plenty of storage for all your grilling gear. Homeowners with large yards or decks can benefit from this little grill, too. The trim design adds distinction and cooking convenience to any outdoor area.